The major goal of the Hydrologic Atmospheric Pilot EXperiment (HAPEX) was to measure the hydrological budget and evaporation flux at the scale of a general circulation model grid square (i.e. 10 km2). In support of this goal, networks were operated for the full year of 1986 in Southwestern France to measure soil moisture, surface energy balance, surface hydrology, as well as atmospheric properties. An Intensive Observing Period (IOP) of two and one half months (1 May through 15 July, 1986) allowed for detailed measurements of atmospheric fluxes and for intensive remote sensing of earth surface properties using instrumented aircraft. At the beginning of this period, the ground was saturated due to the winter moisture, but by the end of the period the ground water had been reduced to about 30% of field capacity. (kneeling) Eric Miller, Paul LeHardy, and Jerry Tejcek. Photo courtesy Bob Bumpas. 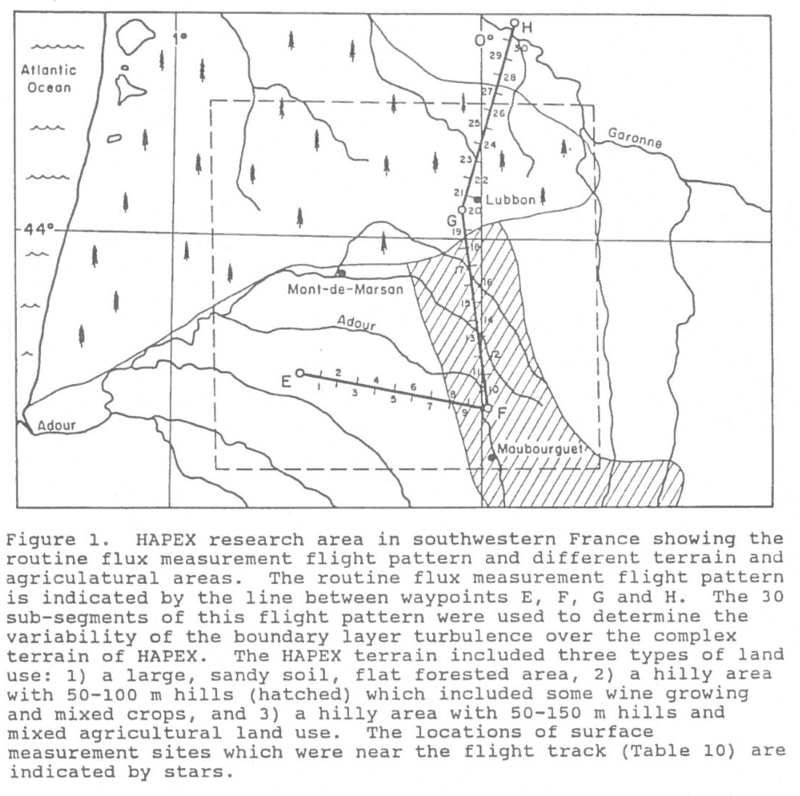 The HAPEX research area (see Fig 1) was a 100 x 100 km area in southwest of France in the vicinity of Mont-de-Marson. The land surface consisted of about 40% forest, about 45% mixed agricultural use, and about 15% wine growing. The forested area was extremely flat, had sandy soil and an altitude of about 80-130 meters, MSL. The balance of the HAPEX research area consisted of hilly terrain with a variety of soil types, hills of up to about 120 meters hill height and a maximum altitude of about 270 meters, MSL. The NCAR King Air aircraft participated in HAPEX with the goal of making routine daytime measurements of the heat, moisture, and momentum fluxes during the IOP. In support of this goal the King Air made 26 research flights during the 67 day long IOP, or about one flight every three days. 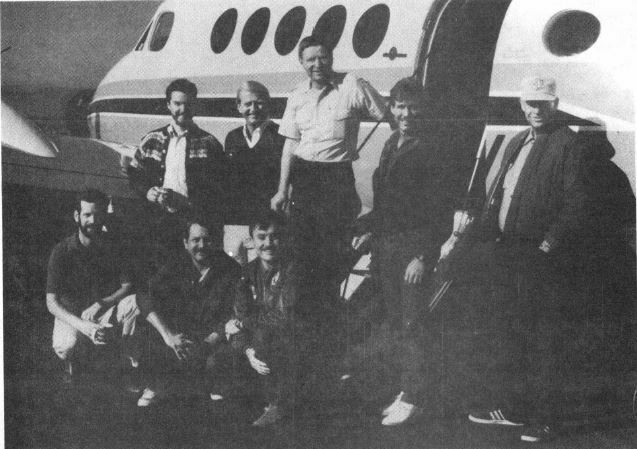 The King Air research flights were generally made in conjunction with the flights of the French Piper Aztec aircraft. The research days were selected to be non-precipitating days.